MORE communities are rallying round to help save Scotland’s ecclesiastical heritage and make the most of a growing number of redundant churches say experts, as Herald Scotland reports on a heritage sector-led event designed to guide communities on how to tackle taking over such historic buildings. Now groups of friends, neighbours and local organisations are being offered the chance to find out how to pool their resources and help raise funds to breathe life back into empty or underused churches that are often ‘iconic’ elements of Scottish cities and landscapes. Experts gathered in Glasgow for an event designed to guide communities on how to tackle taking over such historic buildings, with many already being restored for a wider range of uses other than worship including as a concert venue and for attracting tourists. 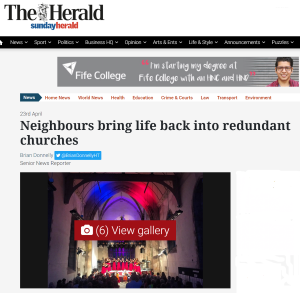 The move is part of a push by lobby group the Built Environment Forum Scotland, Scotland’s Churches Trust, Scottish Redundant Churches Trust and the Prince’s Foundation to save the country’s churches as more become redundant. St Margaret’s Church in Braemar, is an example undergoing regeneration by the Scottish Redundant Churches Trust to turn it into an internationally-renowned performance and arts venue in the centre of the beautiful Cairngorms National Park. It is a nationally-significant Victorian gem that was bought for £1 and now a tourist attraction and music venue but the overall task of taking it on means the community and trust have to raise £2m for its renovation and upkeep. The former Episcopal church was designed by architect and stained glass designer Sir John Ninian Comper, the acclaimed Gothic Revivalist whose ashes are buried in the north aisle of the nave of Westminster Abbey, near a series of windows he had designed.